With unlimited bandwidth for only $4.99/month, GoDaddy can help you get online in a hurry without seriously affecting your bottom line. Also giving you $200 in ad credits for the most popular sites on the internet, you can really get where you’re trying to go with GoDaddy. You’ll be able to build your website using an intuitive cPanel control panel, giving you access to some of the most popular 3rd party applications on the web right now. With helpful support and knowledgebase articles to help you around the clock, you’ll never be left in the dust with GoDaddy. And since GoDaddy specializes in domain name registry, the company could be your best bet to build the site you’ve always wanted with the name you’ve always dreamed of. Featuring the standard cPanel control panel, anyone familiar with website building will feel right at home on GoDaddy. If you’ve never built a website, though, don’t panic: GoDaddy offers easy installations of several leading content management systems, which can provide incredibly intuitive interfaces. Or, you can use GoDaddy’s simple template-based site builder, which gives you simple responsive design features at a low price tag. Setting up email is similarly easy process, which also requires only a few steps. Giving you the option to access you mail easily through your control panel or through an online portal, your service will be as adaptive as it is simple, thanks to GoDaddy. For most people, GoDaddy will offer the features they’re looking for most, including the easy-to-use site builder. But another rather simple option is to use GoDaddy’s cPanel to install over 150 3rd party applications, including Joomla, Drupal and WordPress, to control your site’s layout. With so many website building options, GoDaddy tries to accommodate several styles of webmaster simultaneously. Once you’ve got your website set up, you can now incorporate any number of features, with eCommerce being the biggest interest for most people. Fortunately, GoDaddy has the Zen Cart application built right into its cPanel interface. With Zen Cart, you can easily sell merchandise on your website, stock your products and track sales all in one place for absolutely free. 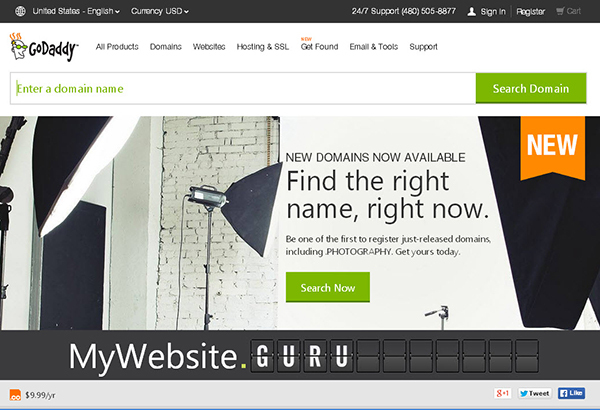 Getting noticed with GoDaddy could also be incredibly easy, since you can easily get a .com domain name for free. In fact, if the domain name you’re looking for isn’t available, GoDaddy will usually suggest related names that could be just as attractive. To really get people coming to your page, though, you’ll want to take advantage of the advertising credits offered by GoDaddy. Even with the most basic package, you’ll receive a $100 Google credit, a $50 Bing credit and a $50 Facebook credit, making you accessible on some of the most popular websites on the Internet. Even for its lowest level clients, GoDaddy includes 100 emails to make your website accessible for all of your visitors. This and your free domain name can give you an inside track on some of the best customer incentives in the industry. For your convenience, GoDaddy provides sales and technical support 24/7, offering knowledgeable and courteous customer support representatives in case any problems arise during your service. Whether you want to use your phone or open an email support ticket, GoDaddy can provide the guidance you’re looking for. Also offering access to a very thorough knowledgebase covering many of the most common questions in webhosting, you can learn at your own pace, if you’d like. This knowledgebase is fully searchable and broken down by popular categories, making your quest to build the best possible website even easier. Starting at $4.99/month, GoDaddy is one of the more powerful webhosts for its price. If you need more storage or email addresses, though, it’s incredibly easy to scale up your service with GoDaddy. For $5.99/month, you’ll get unlimited bandwidth and 500 email addresses, which will put you on your way to creating a powerhouse website. If you need more, though, the ultimate plan will offer you 1000 email addresses as well as an included SSL for you site security for only $7.99/month. No matter what plan you choose with GoDaddy, however, you’ll receive the same capable support and simple interface. GoDaddy didn’t become one of the most recognizable brands in webhosting just because of its marketing campaign. Clearly, GoDaddy works hard for you and your website, offering 24/7 customer support by email and phone. You may not even need any help, though, considering how many completely intuitive site building features GoDaddy can offer you. Whether you want to use the premium website builder or the well-organized cPanel, you’ll find everything you need right at your fingertips. With over $200 in advertising credits for every single package the company offers, GoDaddy can also be a great site to get your business or personal site noticed. At the end of the day, it’s very apparent why GoDaddy is one of the biggest and most popular webhosts, thanks to its powerful features and incredible price tag.